As a new generation of Americans begins to take shape and move toward adulthood, there is mounting interest in their attitudes, behaviors and lifestyle. But how will this generation change the demographic fabric of the United States? 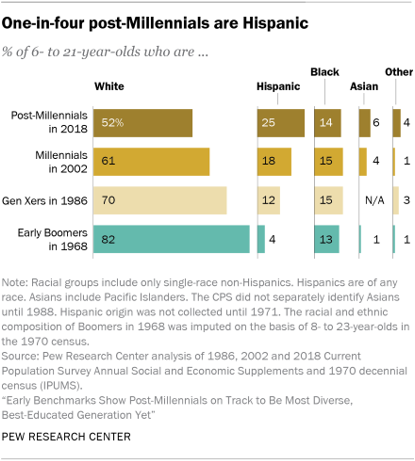 A new Pew Research Center analysis of Census Bureau data finds that the “post-Millennial” generation is already the most racially and ethnically diverse generation, as a bare majority of 6- to 21-year-olds (52%) are non-Hispanic whites. And while most are still pursuing their K-12 education, the oldest post-Millennials are enrolling in college at a significantly higher rate than Millennials were at a comparable age. The parents of post-Millennials are more well educated than the parents of Millennials and those of previous generations, and this pattern most likely contributes to the relative affluence of the households in which post-Millennials live. More than four-in-ten post-Millennials (43%) are living with at least one parent who has a bachelor’s degree or more education. Roughly a third (32%) of Millennials in 2002 had a parent with this level of education. The high school dropout rate for the oldest post-Millennials (ages 18 to 20 in 2017) is significantly lower than that of similarly aged Millennials in 2002. And among those who were no longer in high school in 2017, 59% were enrolled in college – higher than the enrollment rate for 18- to 20-year-old Millennials in 2002 (53%) and Gen Xers in 1986 (44%). More broadly, the post-Millennial generation is being shaped by changing immigration patterns. Immigration flows into the U.S. peaked in 2005, when the leading edge of the post-Millennial generation was age 8 or younger. The onset of the Great Recession and the large decline in employment led to fewer immigrants coming to the United States, including immigrant children. As a result, the post-Millennial generation has fewer foreign-born youth among its ranks than the Millennial generation did in 2002 and a significantly higher number who were born in the U.S. to immigrant parents, though this may change depending on future immigration flows. The generation labeled “post-Millennials” in this report – referred to elsewhere as Generation Z, the iGen or Homelanders – includes those born after 1996. Pew Research Center uses the label “post-Millennials” as a placeholder until more consensus emerges as to their name. 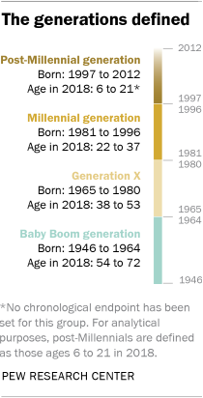 For purposes of this analysis, the post-Millennial generation spans 16 years, the same number of years as the Millennial generation (now ages 22 to 37). That may change as well, as this new generation – and the factors that shape it – come into sharper focus. This report compares the post-Millennials in 2018 with earlier generations when they were ages 6 to 21, examining their demographic characteristics as well as those of their parents and households. The oldest post-Millennials are less likely than their predecessors to be in the labor force. Only 58% of today’s 18- to 21-year-olds worked in the prior calendar year; this compares with 72% of Millennial 18- to 21-year-olds in 2002. And employment among post-Millennials is less likely to be full-time compared with earlier generations. This is likely due, in large part, to the fact that these young adults are more likely than their predecessors to be enrolled in college. The median household income of post-Millennials exceeds that of earlier generations when they were young. The typical post-Millennial in 2018 lives in a household with an annual income of roughly $63,700 after adjusting for household size. That is slightly higher than the income for the typical household in which Millennials grew up – $62,400 in 2002 in inflation-adjusted dollars – and it far surpasses the income of Gen X and Baby Boomer households when they were growing up. This is consistent with the relatively high education of the parents of post-Millennials. A bare majority (52%) of post-Millennials are non-Hispanic white. One-in-four are Hispanic, significantly higher than the share of Millennials who were Hispanic in 2002. The share of post-Millennials who are black (14%) is nearly identical to the share of Millennials who were black at a comparable age (15%). Black representation among the nation’s youth has changed little since the early Boomers in 1968. In terms of sheer numbers, the Millennial generation was shaped to a much larger extent by young immigrants than the post-Millennials have been. When Millennials were ages 6 to 21 in 2002, they numbered 65.3 million.4 Their ranks that year included 5.0 million immigrants. By contrast, only about 4.4 million of the 66.5 million post-Millennials are immigrants – a pattern that more closely mirrors the experience of Gen X. Even with the diminished flow of immigrants into the U.S., the racial and ethnic diversity of the post-Millennial generation is expected to increase in future years as new immigrants join their numbers. 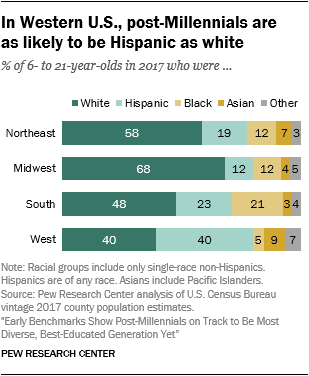 Today’s 6- to 21-year-olds are projected to become majority nonwhite in 2026 (when they will be ages 14 to 29), according to Census Bureau projections. The geography and mobility of post-Millennials differ from earlier generations. Reflecting broader national trends, post-Millennials overwhelmingly reside in metropolitan as opposed to rural areas. Only 13% of post-Millennials are in rural areas, compared with 18% of Millennials in 2002. By comparison, 23% of Gen Xers lived in rural areas when they were ages 6 to 21, as did 36% of early Boomers. In the West, post-Millennials are just as likely to be Hispanic as non-Hispanic white (both 40%). This stands in contrast to older generations. Among those residing in the West, 45% of Millennials, 50% of Gen Xers and 64% of Boomers are non-Hispanic white. Minority representation among post-Millennials is lowest in the Midwest, where roughly a third (32%) of 6- to 21-year-olds are racial or ethnic minorities. When it comes to geographic mobility, Americans are not moving as they once did, and post-Millennials are no exception. About 11% of post-Millennials in 2018 had a different address from a year earlier, implying that they had moved. By comparison, 17% of Millennials and 20% of Gen Xers and early Boomers had moved in the past year when they were the ages post-Millennials are today. While it’s still much too early to draw conclusions, initial signs suggest that post-Millennials are on track to become the most well-educated generation yet. As of 2017 (the most recent year available with school enrollment information) 80% of post-Millennial 18- to 20-year-olds had finished high school.6 That represents a modest improvement from previous generations. At the same ages, 76% of Millennials and 78% of Gen Xers had completed high school. Some of the overall post-Millennial improvement stems from the leap in high school completion among Hispanic youth. In 2017, 76% of Hispanic 18- to 20-year-olds had finished high school, outpacing the 60% of Hispanic Millennials attaining this benchmark in 2002. Black high school completion has also improved: 77% of black post-Millennials ages 18 to 20 had finished high school, compared with 71% of black Millennials in this age group in 2002. Since white post-Millennial high school attainment is no higher than among white Millennials, some of the long-standing racial and ethnic gaps in high school completion are narrower among the post-Millennials than was the case for prior generations. The share of post-Millennials who have dropped out of high school is significantly lower than it was for Millennials. In 2017, 6% of 18- to 20-year-old post-Millennials had neither finished high school nor were enrolled in high school. By comparison, 12% of Millennial 18- to 20-year-olds had dropped out of high school in 2002, as had 13% of Gen Xers in 1986. One indicator suggests that younger post-Millennials are behind where Millennials were in terms of their progress in K-12 education. In 2017, 30% of post-Millennials ages 6 to 17 were enrolled below the “modal grade,” which is the typical grade a child is enrolled in given his or her age. By comparison, a quarter of Millennials and Gen Xers were enrolled below the modal grade in 2002 and 1986, respectively. This indicator is of value because it can foreshadow subsequent dropping out of school, particularly if the student is behind in school due to grade retention. It’s unclear from this data whether students are behind grade-wise due to being held back in school or whether their parents elected to have them begin kindergarten at an older age. Beyond K-12 education, post-Millennials are more likely than earlier generations to be pursuing college. In 2017, 59% of 18- to 20-year-olds who were no longer in high school were enrolled in college. Among Millennials and Gen Xers at similar ages smaller shares were pursuing college (53% and 44%, respectively). 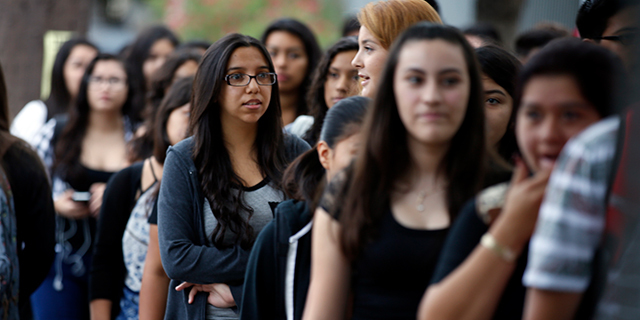 Some of the post-Millennial gain stems from Hispanic youth. More than half (55%) of Hispanic 18- to 20-year-olds who were no longer in high school were enrolled in college last year. Less than half of their Millennial (34%) and Gen X (28%) peers were pursuing college at a similar age. Black post-Millennials are also outpacing the previous generations of black youth in terms of college enrollment. Among blacks ages 18 to 20 who were no longer in high school, 54% were enrolled in college in 2017, compared with 47% of black Millennials in 2002 and 34% of Gen Xers in 1986. Post-Millennial women are showing major strides in college enrollment. In 2017, 64% of women ages 18 to 20 who were no longer in high school were enrolled in college. That’s up from 57% of similarly aged Millennials in 2002 and up substantially from 43% of Gen Xers in 1986. The trend, while more modest, has been upward among men as well. It’s important to point out that future immigration patterns may affect the educational outcomes of post-Millennials, so these generational comparisons represent a current snapshot. Post-Millennials are entering adulthood with less experience in the labor market than prior generations. Roughly one-in-five 15- to 17-year-olds in 2018 (19%) report having worked at all during the prior calendar year, compared with 30% of Millennial 15- to 17-year-olds in 2002. Almost half of early Baby Boomers (48%) in the same age group worked in 1968. Among 18- to 21-year-olds today, 58% were employed during the prior calendar year. At the same age prior generations were much more likely to have been employed. Among Millennial 18- to 21-year-olds in 2002, 72% reported working in the prior year. Among Boomer 18- to 21-year-olds in 1968, 80% worked in the prior calendar year. Post-Millennial workers are less likely to work full-time compared with prior generations. In 2018, only 15% of 15- to 17-year-old workers worked full-time, down sharply from the 26% of 15- to 17-year-old workers in 1968 who worked full-time. The pattern is similar among 18- to 21-year-olds. Over the decades the earnings of American workers have increased modestly, and teens and young adults are no exception. If they worked full-time in 2017, a 15- to 17-year-old typically earned about $5,000 (the median). Adjusting for inflation, a similar early Millennial earned slightly less, $4,200. The median earnings for a full-time 18- to 21-year-old today is $19,000, somewhat higher than the median pay of a similarly aged full-time Millennial worker in 2002 ($16,700). A common indicator of “at-risk” behavior in the transition to adulthood is the share of youth who are neither enrolled in school nor working. Youth who are detached from school and the workplace may not be acquiring valuable learning experiences and networking opportunities. Post-Millennials are less likely to be detached than earlier generations. The shift has been more significant among young women. 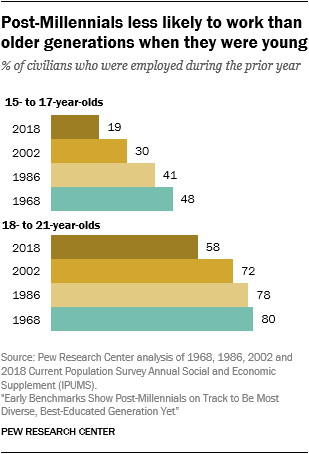 Only 9% of 16- to 21-year-old post-Millennial women are detached in 2018. About 12% of Millennial women and 16% of Gen X women were neither in school nor working at a comparable age. Post-Millennial women who are detached are far less likely to be married than detached Gen X women were at a similar age (12% vs. 37%). Post-Millennial women are more likely to be engaged in school and work than earlier generations in part because they have fewer parenting responsibilities. Teen births have been falling, even recently, and post-Millennial women are more likely to be childless than earlier generations. In 2016, 88% of women ages 18 to 21 were childless, compared with 79% of Millennials and 80% of Gen Xers at a similar age. Steady gains in college completion among U.S. adults are reflected in the households of post-Millennials. Fully 43% of post-Millennials ages 6 to 17 have at least one parent with a bachelor’s degree or more education. This compares with 32% among similarly aged Millennials in 2002, 23% among Gen Xers in 1986 and only 16% among early Boomers in 1968. Roughly two-thirds (65%) of post-Millennials ages 6 to 17 live in a household with two married parents; fully 31% live with a single parent.7 The share of 6- to 17-year-olds living with two married parents is down slightly from the share of Millennials who were growing up with two married parents in 2002 (68%). 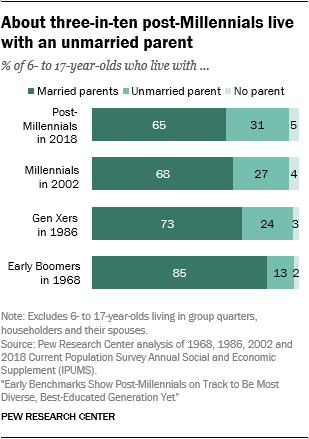 Gen Xers were even more likely to live with two married parents – 73% did so in 1986. And for the early Boomers, this type of arrangement was very much the norm: 85% of early Boomers ages 6 to 17 were living with two married parents in 1968. Of those children and teens who are living with two married parents, most live in dual-earner households. Slightly fewer post-Millennials have two working parents compared with Millennials in 2002 (63% vs. 66%). In 1986, 59% of Gen X youth (ages 6 to 17) with married parents had both parents in the labor force, up substantially from 37% among similarly aged Boomers in 1968. Post-Millennials have the same number of siblings living with them as Millennials did at a similar age – 1.5, on average. This is down substantially from what the early Boomers experienced in their youth. Among those ages 6 to 17 in 1968, the average number of siblings was 2.6. By the time the Gen Xers came along, that number had fallen to 1.6 (in 1986). Older post-Millennials appear to be postponing marriage even more than Millennials were at a similar age. Among those ages 18 to 21, only 4% of post-Millennials are married. Millennials in 2002 were nearly twice as likely to be married (7%), and the rate was higher still among Gen Xers in 1986 (12%). In 1968, 26% of early Boomers ages 18 to 21 were married. Some measures of economic well-being indicate that post-Millennials are growing up in more affluent circumstances than previous generations did. The median or typical household income of 6- to 21-year-olds is $63,700. After adjusting for inflation the typical Millennial grew up in a household with a slightly lower income level ($62,400). 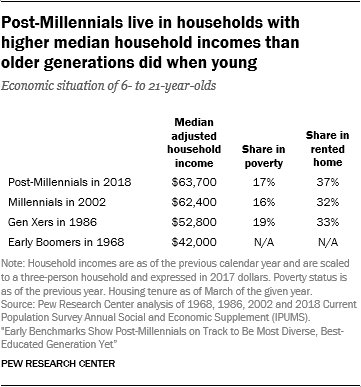 The typical household income resources of Gen Xers ($52,800) and early Boomers ($42,000) growing up were significantly below these levels.8 By the official poverty measure, 17% of post-Millennials live in families that are below the poverty line.9 This may exceed the share of Millennials in poverty in 2002 (16%) but is below the share of Gen Xers in 1986 (19%).